We are a 2nd generation jewellery manufacturer, based in Enniscrone County Sligo on the North West Coast of Ireland, and the Walker family has been making bespoke claddagh and celtic wedding Jewellery and diamond Jewellery for more than 60 years. With our in-house craftsmen and state-of- the-art high-tech machinery, we give every customer the assurance that they will receive Their piece of Jewellery with a perfect finish and of perfect quality. All our diamonds are conflict free and all our gold and silver is sourced from eco-friendly suppliers. Please browse through our collections and you will find an amazing selection. We are very proud of our Jewellery and want to make your choice of Jewellery easy. You can either shop with us online or with the help of a specialist consultant, at wedding shows or , You can also visit our head office and shop in Enniscrone County Sligo, Ireland. 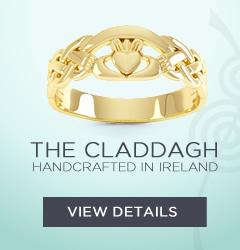 We specialize in bringing you 100% Irish handmade jewelry crafted in exceptional quality metal, we work with Sterling Silver, all Gold types and Platinum and all our jewelry is made at our manufacturing plant at Ardri Jewellery . Please feel free to phone us at any time on (00353)87 949 95 69 or Toll free from USA/Canada 1800-469-6891 if you would like to discuss your very special purchase or feel out our Contact Us form and we will get back to you.